I’m about to complain. Not about the 2017 Porsche Macan GTS, that thing is damn near perfect. I’m about to complain about my life, and you’re going to hate me for it. Oh, I’m sure they’re actually wonderful. For someone. They can be cheap or expensive or fun or sublime and any number of positive descriptors, but they’re not for me. They all either come with vast dishware covered in black cellophane as an excuse for a tire, because they are sports mobiles, or they’re enormous and can’t be parked on anything that’s not explicitly your own driveway. So many cars I’ve tried to survive New York in have been fast and perilous, or big and annoying. Or, even worse, boring. But not the Porsche Macan GTS. The Macan GTS lives somewhere between air-conditioned shopping cart and luxury hot-hatchback on steroids. This is a Porsche that’s also a compact crossover, not the other way around. The Macan GTS is so much hotter than any self-respecting hot hatch should be. And it’s a family SUV, too. 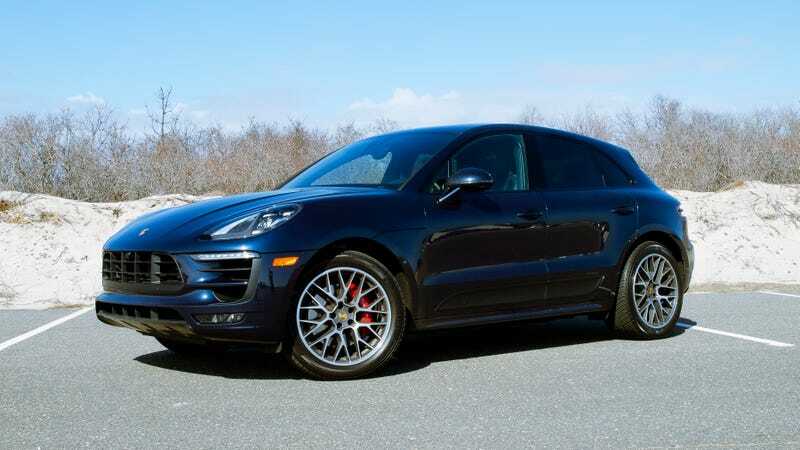 The 360-horsepower Porsche Macan GTS slots right in the top-middle of the Macan line-up, which also sees a base Macan (252 HP), a Macan S (340 HP), a Macan Turbo (400 HP), and the delightfully named “Porsche Macan Turbo with Performance Package,” because you get right what it says on the tin, and 440 HP. Too many performance cars these days are overpowered, 700 pound-foot of torque freaks. That’s great for ripping burnouts and pulling stumps and lighting your hair on fire the one time you ever take it to a track day, but it’s no fun at all within the impossibly tall gray walls of New York. The Macan GTS’s horsepower and 369 ft-lbs of torque are supposed to be enough to move the 4,178-pound vehicle to 60 mph in 4.8 seconds. Plenty of juice to squeeze through the last seconds of yellow lights, but the real magic is in the suspension. The GTS rides on air. More specifically; the Porsche Active Suspension Management system which adjusts ride height and stiffness to seamless switch between rigidity for slicing and dicing through traffic, or compliance to float over lower Manhattan’s cobblestone streets. At its standard posture, the Macan GTS is actually 10 millimeters lower than the high-powered Macan Turbo, putting a little extra emphasis on balance while maintaining a dominant ride height and enough suspension travel for regular rough-road usage. You know what’s good in the Macan GTS? Pretty much damn near everything. The engine? Good. The seats? Splendid. The transmission? It’s Porsche’s dual-clutch setup, which has to be one of the most sublime gearboxes in the world. Pull up a paddle, BLART–thwack as you’re catapulted forward in the edgiest setting. Go down a gear, and the engine screams up the tach. Calm it back down, and everything’s fine in the world. The steering? Pretty much as good as you can ask for a family SUV. No, dullards, it’s nothing compared to a classic air-cooled Porsche 911. But compare it to something like a Mercedes GLC, and you’ll see what I’m talking about. Lower the suspension, throw it into a corner and hold on tighter than you should have any right to. It’s wonderful. We’ve complained about this sort of thing before, but Porsche’s arcane ordering system, with its dizzying array of configurable options, left me with a Porsche SUV costing around $75,000 complete with everything a boy could love. A dual-clutch gearbox, a racy engine, air suspension that moved it up and down at will, but no navigation system and remarkably, no provision to Bluetooth my phone to the car stereo. Please see update below. If you’re thinking “what,” mmm, yes, exactly. Big city living requires moving and shaking and business, friends. And I am not about to be seen in my Porsche with a Bluetooth earpiece like it’s 2001. Seriously, I need to take calls while my exhaust is reverberating off the glass windows on Wall Street. But no, the company insists on nickel-and-diming people on everything. Which is how you can end up with absurd situations like a base Macan with a piddly 240 HP costing $123,100. And that’s just rude! You can get a very nice Range Rover for that sort of money, and have enough left over for a Fiat 500 Abarth on the side that’s so cheap you could feel totally comfortable crashing it into your nearest tree and buying another one. Crossovers have consumed city streets because they’re pretty good at everything, even if they don’t stand out doing anything. With this car configuration, cargo and passenger capacity is above adequate, fuel economy is okay, poor-weather performance is acceptable and there’s usually some vague notion of “adventure-readiness” in the mix. It’s exciting enough to save some of the soul you lose living in the city, tough enough to survive the inevitable beat down of ripped-up roads, poor parallel parkers and a sea of taxi cabs you want to be able to see over. We’re always getting questions asking “What Car Should I Buy,” with a price range of $20,000 – $80,000 and it needs to be fun and sporty and it needs to haul the kids and it needs to not make you look sad and you need to be able to go somewhere in the winter. And it needs to have a manual. Obviously. Of course, the answer to all of those competing, deeply strange demands is a 996-generation Porsche 911 Turbo. But if you can’t do that, or most of that, you might as well get a Porsche Macan GTS. It’s everything you want, without any of the pain.